Installed in the garden, outside the nymphaeum, of the Villa Litta Visconti Borromeo, Lainate, near Milan, before 1617 (and possibly part of the original installation completed in 1589); purchased c. 1865 by"Prince Napoleon," Palais Royal, Paris; (his sale, Christie, Manson & Woods, London, 9-11 May 1872, 2nd day, no. 221, with NGA 1937.1.132 as no. 222); Wareham; (sale, Christie, Manson & Woods, London, 25 July 1891, no. 91, with NGA 1937.1.132 as no. 92, withdrawn); (sale, Christie, Manson & Woods, London, 20 May 1892, no. 147, with NGA 1937.1.132 as no. 146). Marquis de Ganay, Paris, by 1913; purchased by (Duveen Brothers, Inc., London, New York, and Paris); purchased 15 December 1936 by The A.W. Mellon Educational and Charitable Trust, Pittsburgh; gift 1937 to NGA. Giancarlo Gentilini and Alessandro Morandotti, "The Sculptures of the Nymphaeum at Lainate: The Origins of the Mellon Venus and Bacchus." Studies in the History of Art 24 (1990): 135-171, especially Appendices A and B, which detail the documentary evidence, and 166 n. 3, which discusses the later history of the sculpture's whereabouts and details the inaccuracies in previously published versions of the provenance. This was probably Napoleon Joseph Charles Paul Bonaparte (1822-1891), who was a first cousin to Napoleon III, and commonly known as Prince Napoleon and occasionally as Prince Jerome Napoleon. He occupied the Palais Royal during Napoleon III's rule as head of the Second French Empire, 1852-1870. The 1891 and 1892 sales were kindly brought to the Gallery's attention by Patricia Wengraf; see her e-mails of 3 February 2009 to Alison Luchs, in NGA curatorial files. Both sales, according to the catalogues, were ordered by the Chancery Division of the High Court of Justice as part of the case of Trau v. Wareham. The sellers are recorded in both years as Messrs. Rye and Eyre of Golden Square, London; the buyer in 1892 is recorded only as the initial "J." Lynda McLeod, Librarian, Christie's Archives, kindly provided the seller and buyer information in her e-mail of 1 August 2012, in NGA curatorial files. Letter from G.H. McCall, Librarian for Duveen Brothers to Charles Seymour, Jr., 6 March 1940, in NGA curatorial files. The original Duveen Brothers invoice is in Gallery Archives, copy in NGA curatorial files; the sculpture is listed as by Jacopo Sansovino. Exposition d'Objets d'Art du Moyen Age et de la Renaissance, Paris, 1913. Cortissoz, Royal. An Introduction to the Mellon Collection. Boston, 1937: 28. Preliminary Catalogue of Paintings and Sculpture. 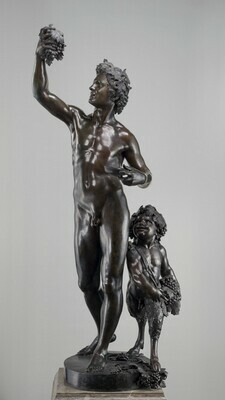 National Gallery of Art, Washington, 1941: 236, A-22, as Bacchus and a Young Faun by Jacopo Sansovino. Book of Illustrations. National Gallery of Art, Washington, 1942: 253, repro. 236, as Bacchus and a Young Faun by Jacopo Sansovino. De Tolnay, Charles. Michelangelo. 5 vols. Princeton, 1943: 1:144. Swarzenski, Georg. "Some Aspects of Italian Quattrocento Sculpture in the National Gallery." Gazette des Beaux-Arts 6th series, 24 (November 1943): 301 fig. 16, 302, as by Jacopo Sansovino. Duveen Brothers, Inc. Duveen Sculpture in Public Collections of America: A Catalog Raisonné with illustrations of Italian Renaissance Sculptures by the Great Masters which have passed through the House of Duveen. New York, 1944: figs. 189-193, as by Jacopo Sansovino. Weinberger, Martin. "Book Review, review of The Youth of Michelangelo, by Charles Tolnay." The Art Bulletin 27 (1945): 69-74. Paintings and Sculpture from the Mellon Collection. National Gallery of Art, Washington, 1949 (reprinted 1953 and 1958): 169, repro., as Bacchus and a Young Faun by Jacopo Sansovino. Valentiner, Wilhelm R. "Shorter Notes: A Neglected Sculptor in the Mannerist Exhibition at Amsterdam." The Art Quarterly 19 (Spring 1956): 41-49, repro. fig. 2. Summary Catalogue of European Paintings and Sculpture. National Gallery of Art, Washington, 1965: 170, as Bacchus and a Young Faun by Jacopo Sansovino. European Paintings and Sculpture, Illustrations. National Gallery of Art, Washington, 1968: 150, repro., as Bacchus and a Young Faun by Jacopo Sansovino. "The Mellon Venus." National Gallery of Art Newsletter (July-August 1987): 5. Gentilini, Giancarlo and Morandotti, Alessandro. "The Sculptures of the Nymphaeum at Lainate: The Origins of the Mellon Venus and Bacchus." Studies in the History of Art 24 (1990): 136-138, 155-160, repro. Lewis, Douglas and Luchs, Alison. "Report on the First Curatorial Colloquy at the National Gallery of Art, June 1987." Studies in the History of Art 24 (1990):131-133. Sculpture: An Illustrated Catalogue. National Gallery of Art, Washington, 1994: 151, repro. Zanuso, Susanna. "Marco Antonio Prestinari: Scultore di Federico Borromeo." Nuovi studi 5 (1998): 85-109, fig. 185. National Gallery of Art Special Issue. Connaissance des Arts. Paris, 2000:59. Morandotti, Alessandro. Milano profana nell'età dei Borromeo. Milan, 2005: 39, 42, 58, 77 n. 6, 85 nn. 232 and 238, 242-243, figs. XXII, XXIII, 282 fig. 204.